Are we too forgiving of narrative weakness in hero fantasy video games? Since the release of Uncharted 4 on PS4, I have been replaying the first three Uncharted games for the first time since I originally played them. I still maintain that they are fantastically produced action adventures, but something has been standing out to me more and more as I progress through the series. While I can suspend my disbelief in many regards, some of the plot holes in the Uncharted series are unbelievably egregious, to the point I struggle to understand how they made it to any completed narrative. 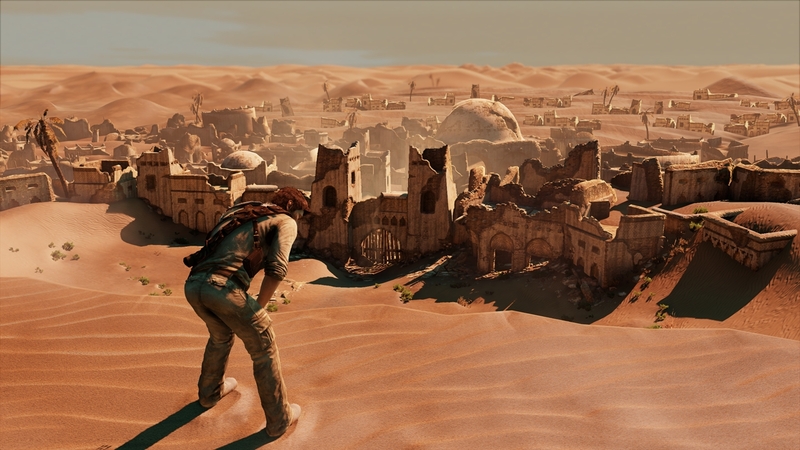 In Uncharted 3, Nathan Drake spends multiple days and nights wandering alone in a desert with no food, water or supplies. As the days wear on he is shown to be weak, exhausted, barely able to walk and even begining to hallucinate from fatigue and weakness. This is a narrative plot point made, and reinforced by the gameplay. Drake eventually stumbles upon an abandoned town in the desert. He struggles to climb a wall into the city, struggles down into an old well, before finding that what little water exists in the well is undrinkable. Thirty seconds later, Drake realises the town is filled by a small army of enemy soldiers. Drake is unarmed, and on the verge of death. He instantly regains all his strength, beats a man to the ground, steals his gun and proceeds to mow down this small army single handed. At no point does he seem to struggle in the slightest. I am willing to forgive many of the fantastical things Nathan Drake manages to do. His ability to withstand large amounts of gameplay gunfire make sense from a gameplay perspective and underlies the developer’s ability to make the character compelling as a hero fantasy protagonist. My problem is when the game actively tells me something about the character, then expects me to ignore that for gameplay reasons. The fact Naughty Dog go to great efforts to show Drake on the verge of death suggests it’s important to his arc as a character. Having him suddenly back on his feet strips that previous section of impact and makes it feel weaker by comparison. In this particular example, Drake even found a well just before the firefight broke out. What purpose was served by making that water undrinkable? If that water had been drinkable, that would have gone a huge way to explaining the character’s sudden return to strength. Better yet, why not build your action setpiece around the fact it’s done by a character dehydrated to near death. Have him take out one or two people by sneaking up on them. Have him drink from their canteen and rest up a little. Ramp up the setpiece to be the heroes return to form. I think that our willingness to hand wave away moments of narrative weakness like this in hero fantasy, particularly male led hero fantasy, is a big part of why video game narratives are struggling to grow compared to other forms of narrative media. Neither gamers or critics hold hero fantasy, a huge section of the most widely played video games, accountable when they take weird narrative shortcuts. Easily fixable plot holes I can spitball quick narrative solutions for should not be forgivable in modern AAA video game storytelling. I think it’s worth noting before I go further, I get that for many of you reading, video games are primarily about mechanics over narrative. While I appreciate that difference in tastes, I would argue that in this day and age there is no reason video games that aim to blend narrative and mechanics should not be able to do both well. It’s also important to note here that I would make a distinction between games aiming for a rich narrative (Uncharted) and those games not interested in narrative depth (Mario). While it’s tough to draw a definitive line in the sand regarding where games should start being held accountable to these standards, I feel most gamers should be able to get a sense of if a video game was attempting to tell a narrative they felt was an important component of the product just by playing it. The reason why above I specified male led hero fantasy as having a problem with proper critique is that, while not exclusively an issue for male led hero fantasy, hero fantasy featuring female leads tends to see a higher level of scrutiny applied to it. A great example of this would be the critiques made of Tomb Raider 2013 and Lara’s quick turn around from afraid to kill into skilled murderous machine. I would argue that this is no more or less aggregious a narrative issue than Drake’s magical dehydration recovery, but it saw an awful lot more critique applied to it. You see the same with movies centring on female leads with the use of the term Mary Sue gaining prevalelance. While there is still a lot we overlook in female led hero fantasy adventures, male led examples see a far lower level of scrutiny in my experience. While I understand that any power fantasy narrative in any medium requires a degree of suspention of disbelief. I have to accept that Nathan Drake is an expert in weilding an ungodly number of different weapons, that he can magically heal his own wounds and that he can survive taking an RPG to the chest. I should not have to ignore plot points, built up in the narrative, because the narrative designer now decides it’s no longer important. I think until we start being critical of these kinds of elements, video game stories are going to stay stagnated at a certain level of quality. I think this is one of the big barriers keeping us tethered to the idea that video game narratives cannot be as high quality as those in other media. It’s complacency, and we need to start holding games to a higher standard in this regard. Mario is about the main character chasing a hostage princess across the globe. The gameplay is perfectly in sync with this. Sure, it isn’t an overly complex narrative, but the gameplay and narrative are in agreement. Old school games in general tended to use elements of story to give the game context, which is an approach that fundamentally hampers the telling of a ‘True Story.’ Games that did have a real story, like Ninja gaiden, made it very clear that the cutscenes were the actual story, and the gameplay was largely metaphorical. Level two: You broke out of prison. Level three: You travel from place A to B. Does it make sense that everyone and their bird is after you? No, not really, but then that never actually happened. It’s just a metaphor for a relatively rough journey. Somewhere along the line between playstation 1 and 3, we lost the clear distinction between what ‘really happened’ and what were just ‘in game representations’. Without a clear visual cue, like a transition in quality, it becomes more important to take a hard look at the narrative consequences of implementing mechanics a certain way. One of the things I loved about Metroid Other M (talk about a game that didn’t think the narrative consequences of its mechanical choices through) was that I actually felt like I was playing as the nimble Samus and not a tank that can transform into a ball. Whenever this topic comes up I like to compare Fire Emblem 7 and 8, or Fire Emblem and Sacred Stones in the west. The former contains a very constrained narrative. The only way to deviate from the linear level selection is by competing special objective at certain chapters. It also has a relatively small cast of characters that are almost all directly relevant to the plot, and most importantly, you cannot buy items between levels. In Sacred Stones, you unlock special locations, you travel across the world to shop for special items between missions, you fight undead hordes in your way and in doing so gives you both endless grinding opportunities and opportunities for characters to build relationships. While all of this gives you more freedom, it also wrecks some of the most important mechanics that FE 7 relied on to make its story work. For starters, there is no sense of continuity between chapters. If I travel halfway across the continent, promote my new unit I just gained and have her become a cherished member of my team with plenty of support, I won’t buy for a second that the party rushed over to save place X as fast as they could. I’ll be like huh, what are we doing here again? Oh right fight these guys sure. In FE7, there is no such break in flow, so when they say: Stock up on gear because you’re going to an uninhabitat island to fight a bunch of tough battles, you better restock like mad. Then, afterwards, when you’re almost out of weapons, it feels like you’ve exhausted everything you’ve got, and you’re as much looking to catch a break as the characters. Supports also have far more plot to hook into, because certain support conversations can only happen X number of chapters in, so they can reference events from before that. Finally, Nino is considered a progidy, who simply never got to learn magic, so while her growth is amazing, she starts out incredibly low level. Her supports with certain people reflect this, as Canas teaches her to properly read/ use tomes, rather than relying on talent and imitation like she did before. Finally, there’s Ninian and Eliwood, who get to spend only a very limited number of chapters together. Getting them to A rank is a real challenge, so if you do, that means they’ve spent a lot of time together and bonded intensely in that small time, exactly the kind of thing that would makes the difference in her choice (leaving to live a long life on the other side or staying shortly with Eliwood) feel completely justified. These things all interlock to create a larger narrative. I don’t disagree that there is a problem. And yes we should and presumably do want all aspects of our games to be good. But I’m not so sure about this notion of holding creators accountable for a game that falls short in one aspect, just because it’s clearly intended to do well in both. The trouble is that when you have a great time with a game it is very difficult to turn around and tell the developers they should have done something better. Its difficulty doesn’t mean people shouldn’t do it, but it’s a very high expectation to have of the average consumer. It’s a more reasonable expectation for critics, but aren’t they writing to convey to their audience what their chances are of liking said game? Thus if most of them aren’t fussed, doesn’t glossing over narrative hangups potentially makes sense. I’m not saying they shouldn’t be mentioned but just getting a brief mention doesn’t sound like what you’re aiming for. That said, the fact that we take a more critical eye toward Laura Croft is a bit rubbish. Thankfully, despite it being mentioned I don’t think Tomb Raider was any less well received for its dissonance. Great article! I was the one who posted the canteen idea on twitter. I’ve been thinking a lot lately about using character weakness as a mechanic, and think it’s a great way to add tension. It makes the player feel vulnerable again, forces them to rethink their play style, and adapt to new circumstances. I just recently played through Affordable Space Adventures, and the point towards the end of the game where different systems on your ship start to shutdown was the most engaging and intense part. You spend the whole game learning new mechanics and developing solutions to problems using those new mechanics, but then suddenly that’s all striped away and you’re forced to improvise new solutions or use mechanics in ways you hadn’t thought of before. It’s very powerful stuff! As far as the power fantasy aspect goes, I feel like having those moments of vulnerability make the moments of power feel even greater. I was thinking about how triumphant and amazing the end of Journey feels after you spend the previous section slowing down and losing your power. Having that contrast in power has much more impact than the usual steady increase or constant high that most games use. I would say the reason it’s not usually commented on in Uncharted is because most are too engaged in the game, and more specifically the gameplay to really notice any ludonarrative disco biscuits. i.e. the game distracts you from narrative weakness through engaging gameplay. Especially in uncharted, where a lot of people not only have to focus their attention on the fire-fights, but also on searching every little inch of the world for treasures. And also, adding to that, you might be distracted by some of the quite frankly stunning environments and set-pieces. I’m not saying there isn’t some internal bias that makes us criticise female protagonists more for this, but it certainly wasn’t the sole, or I believe even the main reason it was criticised as much as it was. I would say the issue for me is less of a case of forgiving narrative weakness based on the gender of a character, rather than forgiving narrative weakness because of the hype generated around the title. If you look back at the release of the first Star Wars prequel (wow, using Star Wars as a reference twice, hmm), you’ll notice that the initial reception from critics was extremely good, because there was that much hype around the release, and it was only when the hype died down and people took a step back that we all realised how bad that film actually was. Of course, that’s an extreme example, but I believe the point still stands clear. Uncharted is to the point where it is so hyped, that people don’t even notice the faults, and even at times, may notice them, but they refuse to recognise it has faults, because they’ve built the game up in their minds as some sort of godly being. That is the problem that needs to be tackled in recognising, and criticising narrative weakness, I believe. So tl;dr, I completely agree with almost everything you said, apart from when you said it was mostly caused by having a male lead and not a female. I think this is certainly an important factor, though not nearly the entire reason. Mastery and frankly outright DieHard ‘santa logic’ is different. For TR13 they went and said(roughly) we threw away classic lara for lameass lara because ‘realism’. LOVE(not the feminists and matriarchy beaches obviously), we miss. I personally go through what i call the ‘change of battery’: after a seriously big effort like …a 100m sprint(im not an athlete) with no food no water, just a bit of rest,(10min?) i can get back up. tired, but able. Bruce Willis’ DieHard and IndianaJones’ tree the game obviously fell from (and The Mummy too but it is already kinda a parody of the two others, DieHard being a modern use of the ‘unkillable but likeable and relatable because struggle’ hero), let Nathan be the incredible NOT-badass but kicking asses allday everyday anyway, he is. That’s where your comparison is weak. TR13 is what it is because of an outright claim to realism. while i can get down and dirty in the peace of sheat that game is(i really miss the only heroin like lara croft gaming has:CLASSIC lara croft), i ll avoid ranting for pages with an english i heard was bad. and a grammar that is worse. Dont get me started on TR15 and the double dipping IN A TEE in siberia’s water and no pneumonia. TR13 and its ‘one bit of deer a week’ stupidity(lara ate once; at the beginning of the game. the game lasts around a week…anyway. i said no rant). Karin Kanzaki is strong willed enough to go through that island. Arrogance, suffisance, overconfidence would have made a much better way for lara to graduate from college to killing&surviving. instead they painted her a victim then a survivor. like she HAS to go through a rapey(a joke of a portrayal, really, who, not having seen a woman in DECADES goes for the NECK kiss? Parade a woman around in a jail of men and see if their attitude suggest ‘neck kisses’. or checkers. or picknick). YOU CANT MAKE REALISM HAPPEN, DONT ADVERTISE IT AND DONT CHANGE THE HEROIN! Say what you want to do, be honest and reveal that you weakened the favourite heroin of many gamers to cater to women and feminists&matriarchs! (the ‘you’ here is for cristaldeenamicks). As soon as Lara went to creestalldicknamits, they flanked her with 2 guys. she never needed guys before, they put a knowledge guy and a tech guy. like she cant make it without communicating with them. now ppl make excuses for the sheat they call lara croft now. Her never shooting anyone then it becoming like putting on shoes afterwards is just the tip of the mountain of sheat creeptalldienamics shat all over gamers. two movies i thought would be the basis for the couple-dynamics in Uncharted 4.
characters are written out of what they were set up as (how come elena doesnt understand a lie after he jumped the fence in 3 and left her, started the plane in 1 and left her? in Romance in the Temple of doom, the fem character would have been PISSED! ‘AGAIN?? ?’ instead, its silence treatment and affection held hostage. PARENTING. the game hold back on a mecanic we are all used to since 1: fisticuffs and think we wont notice it is not possible to win against Nadine. not in a SNK boss syndrome style or like ‘the heavy’ in Uncharted 3 but more like watching a cinematic where you ….anyway. i must not rant on uncharted4 either. I kinda agree with your argument you know. You cant compare both that way. Also. WonderWoman is the only one out of the 3 who doesnt have muscles. She is the most ‘warrior’ of them all, took em all(justice league) down in a comic once. do you think Seth Green can play batman? bruce wayne? gal gadot, miranda kerr and other models can play the centuries honed warrior. New Lara is not “lame” at all, old Lara was nothing more then a one-dimensional sexualized character(IMO, none of the Tomb Raider games before Angel of Darkness have aged well at all), she needed to be changed for the reboot. She was not “weakened” to cater to feminists, that’s one of the dumbest things i’ve heard anyone say about TR yet. You seriously need to take some English, your poor grammar makes your post almost impossible to decipher. The Lara Croft element seems to exist purely to create an issue around gender bias when it really is nothing of the sort. In the Tomb Raider reboot we start with I guess you can call her Lara the every girl, we are shown nothing but averageness, we have 1 scene that sees her have to kill a deer to survive and suddenly from that she’s a non stop killing machine. If you want to make that easier to swallow then replace the deer with a human enemy that has her in a situation that leaves her no choice…this is then spun out as Lara having to do whatever it takes to survive. To compare that to Drake’s sudden ability to not need a drink is like this article looking for a point to make for the sake of making a point. Nathan shows the exact qualities used by every character of his type be they man, woman, beast or alien. How far should they drill down to appease an issue that frankly doesn’t exist for most people. Christian Batman Bale’s Magic Knee Brace, Instafix back, long distance teleport and petrol based logo fuckery. Rocky’s magical near death comeback in about 5 films. Darth Maul’s magical survival for the sake of merchandising. …none of the above matters because of the suspension of disbelief in order to progress and bolster the narrative. Like I said on twitter you never saw Jack Bauer go for a wee, does this mean he doesn’t wee and therefore takes me out of the narrative? That part didn’t bother me too much(mostly cause I see stuff like that happen in movies and TV shows all the time, so i’m used to it by now), but it did make me scratch my head a little bit. I don’t get people calling Rey a Mary Sue.